Aim: To use different sounds and wave file to connect the viewer and intuitively propel the imagination towards the sun as a source of sustainable energy and inventions that will guide us into more holistic and sustainable future. 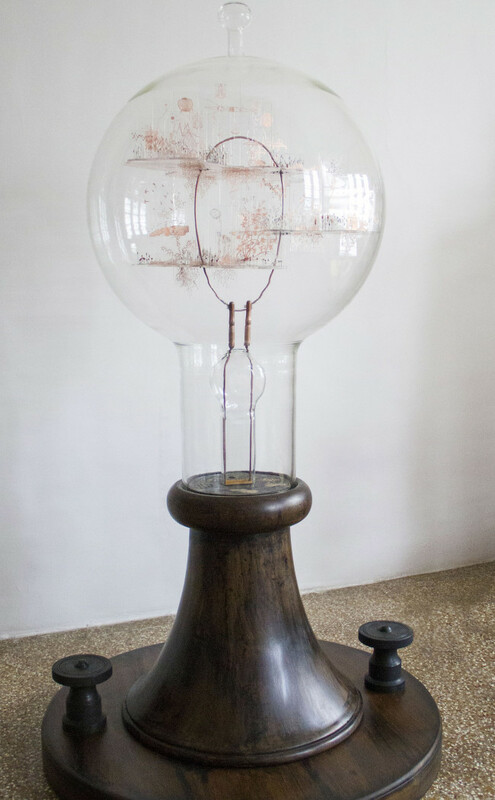 hEliOpHiLic obSeRVatOry is an ode to the Sun, inside Edison’s first patented light bulb. This is an interactive sound installation that can be powered by solar energy. “the Light bulb” by Edison was one of the three main inventions in the world which changed the destiny of our civilization. The invention of light bulbs leads to electrification of cities. Electricity reaching industries and houses lead to other inventions. There was an abrupt rise in productivity from the 19th century onwards. There were two ways in which electricity could be transferred DC and AC. AC was a far more efficient way of transferring electricity that was patented by NicolaTesla. A lesser known fact is that Tesla envisioned a world where everything was powered by free sustainable energy. He believed that tapping ambient sources of heat in the air, water and ground are the most important technologies to develop. Tesla’s free-energy concept was patented in 1901 as an “Apparatus for the Utilization of Radiant Energy.” The patent refers to “the sun, as well as other sources of radiant energy, like cosmic ray”. Some say he invented free energy and his funding was withdrawn, as a meter couldn’t be put on it. The artist wonders if we had followed Tesla’s vision how would that one decision regarding an invention shaped the Earth and it’s people. The question then arises then is what inventions are being invested into and do the material and monetary benefits of inventions outweigh whatever human cost might arise? 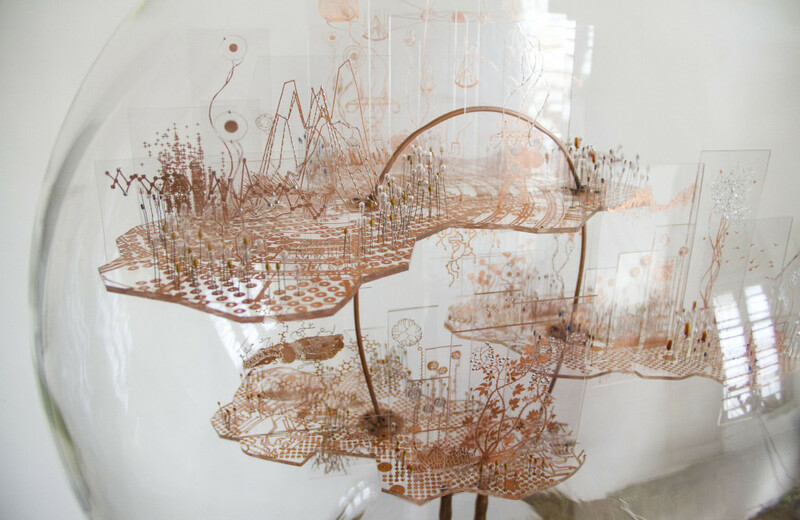 On a visual level, the transparent slides show an organic integration through mixing of circuit schematics, nature and data. Over the year, Nandita Kumar has collected varied data such as the spectrogram of the sun, sunspot cycles, phototropism, Atomic composition of the sun, weather changes, geomagnetic storms, circadian cycles, old astrological maps, vitamin D structure, biomimicry of chloroplasts by copying sun harvesting etc. She creates three different landscapes from data collected from how the sun impacts the Earth, the human body/ Animals/ Birds and Plants.. These slides are created with the same methods used when early PCB boards were printed through screen printing. This interactive eco system when exposed to light/sun erupts into sounds of the sun inside the glass bulb. This sound changes with the change in indentation of sunlight, which is measured by a solar sensor used in satellites. The sound produced through this sensor is a sensorial understanding of the sun and divided into three parts of the day and changes from an awakening planet to twilight. The second form of interaction comes when the bulb senses movement outside the bottle. These sounds are generated from a graphic score created from the data collected and processed through an image to sound convertor to generate the sounds. These sounds are overlaid on the pre-existing layer and therefore leading to an ever-changing organic sound composition which juxtaposes sensorial and technical understanding of the sun. The process of representing information through music is known as “sonification”. Good data sonification reveals something about the data that couldn’t be revealed any other way; it has to succeed where the charts and graphs and scientific lingo failed. The ease with which we hear pitches raise and lower, music seems to be the perfect vehicle with which to demonstrate large quantum data received from the sun. I intend to use different sounds and wave file to connect the viewer and intuitively propel the imagination towards the sun as a source of sustainable energy and inventions that will guide us into more holistic and sustainable future. The sun’s data was used to create the sound. The score contains the sun’s spectrum from 10/12/12 to 11/12/13 and it is overlaid with data informed by the sun. This score was passed through a software and sound was derived from it. This sound was used in the hEliOpHiLic obSeRVatOry as the second layer of sound, once the motion sensor was activated. More to come: Documentation in process!